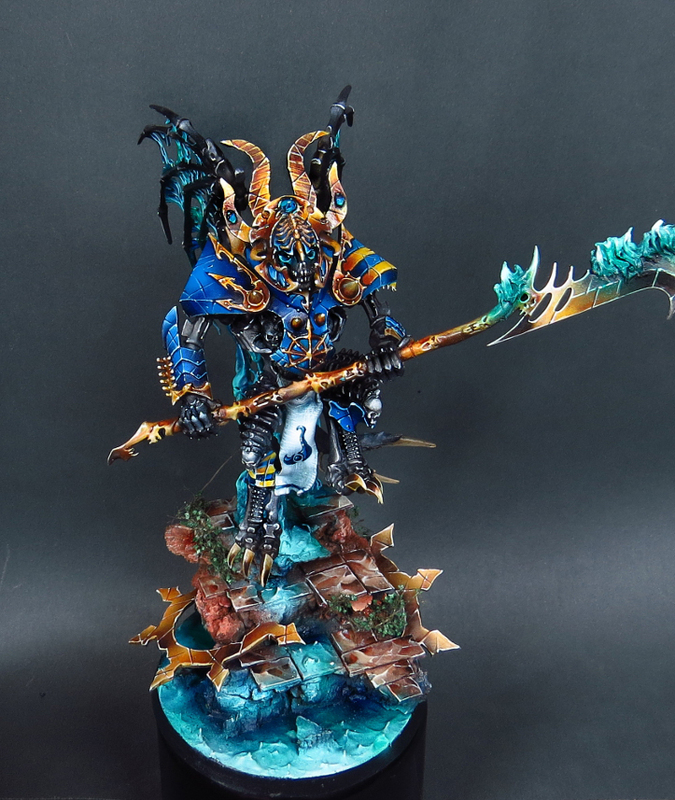 All hail Nagash and Magnus, right? You knew it was going to happen as soon as you saw the Morghast models. 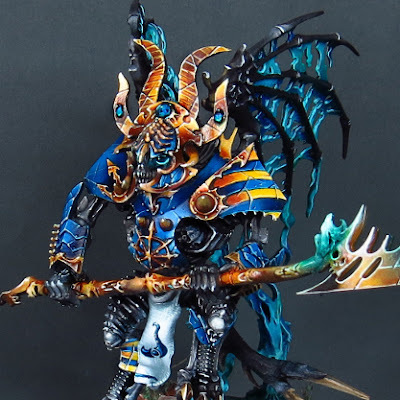 They had a ton of Egyptian themed bits on them to fit in with the Tomb Kings and looked unique enough from undead that they can pass as a Demon Prince fairly easily. This hobbyist really nailed the look and feel though. There is no way to mistake this for an undead model, it really looks like a demon of Tzeentch. The conversions are small and subtle, just some extra armor and horns I think, but they do enough to push this into the Chaos side of things. I really like all of the effort put into the base. It's perfectly trippy enough to convey the warping power of Tzeentch. The painting on this is outstanding as well. The blues, yellows, and golds really pop! The battle damage on it is a little cartoony for my tastes, but it doesn't really detract from the model at all. I think my favorite color choice is the turquoise for the base and the magical flames. I might have painted the skulls making up it's body as magical as well. The only thing I can think of that I may have done differently myself would have been to use feathered wings to reinforce the Tzeentch demonic look more. The stock wings work just fine though, and all and all this mini is a really nice, simple, and well executed conversion.